On a brisk evening that felt more like spring than winter, Scotch enthusiasts gathered at Craft for a preview tasting of the Glenfiddich Snow Phoenix, at an intimate event hosted by Mitch Bechard (Glenfiddich Ambassador, Western U.S.). 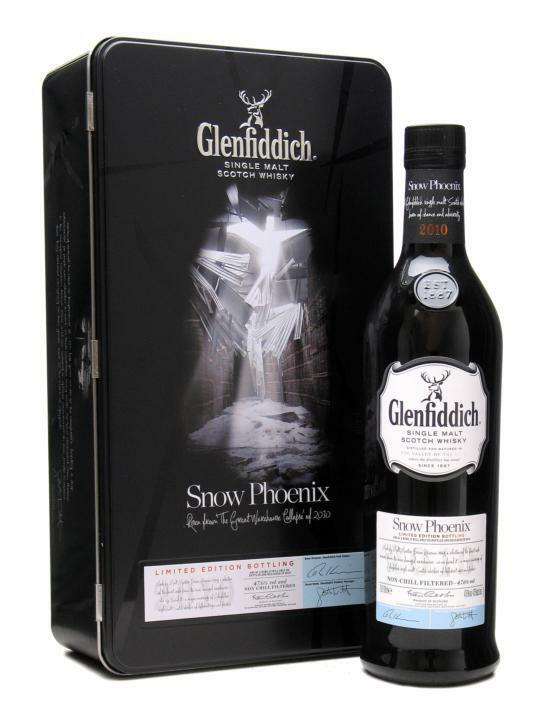 The Snow Phoenix is a one-time 2010 bottling of cask strength, non-chill-filtered Glenfiddich whiskies of different finishes and ages (from 13 to 30 years). Record snowfall and a subsequent warehouse roof collapse at the Glenfiddich distillery forced the limited edition Snow Phoenix into production. As the event began, guests mingled on the patio for passed appetizer trays and a trio of Scotch-fueled cocktails. Bechard recommended the Smoke on the Orchard: Glenfiddich 12-Year, cold smoked Bramley apple, winter spiced maple syrup, lemon juice, egg white and mole bitters. It was a good call; nice smoke and depth, well-balanced between sweet and sour. After the cocktail hour we gathered in the tasting room, where we would learn the story behind the creation of the Glenfiddich Snow Phoenix. In January 2010, after weeks of heavy snowfall and record low temperatures, several warehouse roofs at the Glenfiddich distillery collapsed under the weight of four feet of snow. Bechard noted that Glenfiddich wasn’t the only distillery that sustained damage that winter; the Press & Journal reported that the roofs of twenty-one Chivas Regal warehouses collapsed because of heavy snow. With hundreds of maturing casks of Glenfiddich exposed to the unforgiving winter weather, Glenfiddich Malt Master Brian Kinsman assessed the situation and found inspiration. Kinsman selected casks of different ages and finishes (including Oloroso sherry and American oak) to create a non-aged single malt whisky. The Snow Phoenix has not been chill-filtered and is bottled at 47.6% ABV. Unlike its namesake, the Snow Phoenix will not rise again; the distillery has hopefully ensured that the circumstances that led to the Snow Phoenix’s creation won’t be repeated. The Snow Phoenix name was inspired by photos taken of the warehouse roof collapse. In one picture, the light shining through the hole in the roof resembles a phoenix; that photo is on the front of the Snow Phoenix presentation tin. The light shafts are used as design elements, evoked with cuts in the tin’s foam insert as well as in promotional graphics. Having worked around the clock in harsh conditions to save their whisky, the Glenfiddich distillery team had a newfound appreciation for the Cairngorm Mountain Rescue Team (CMRT), an all-volunteer group of mountaineers who battle extreme weather to save lives in the Scottish Highlands. Glenfiddich subsequently dedicated Snow Phoenix to the CMRT and became a sponsor of the nonprofit. To celebrate this partnership, Kinsman invited a group of CMRT team members to a mid-mountain tasting, where the Snow Phoenix tasting notes were developed. 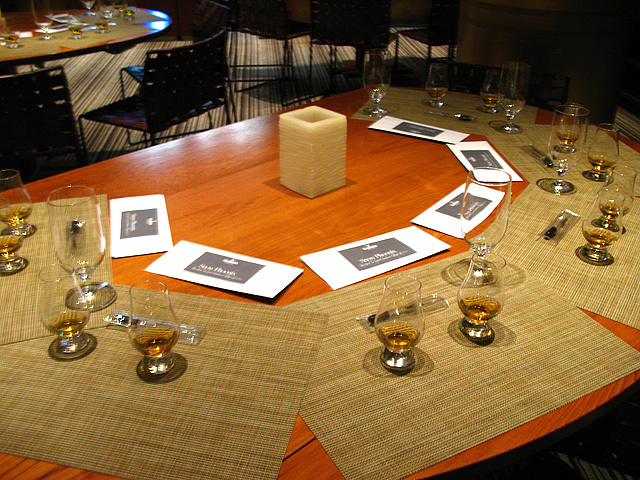 Before we sampled the Snow Phoenix, Bechard warmed us up with drams of the Glenfiddich 12 Year Old and the 15-Year. In a nod to the Snow Phoenix, the effect of cold on Scotch whisky was demonstrated with second drams of the 12 and 15. The Glenfiddich 12 Year was kept in the freezer for 24 hours, softening its signature pear notes and mellowing its already-smooth and creamy mouthfeel. The 15 Year Old was served with an ice ball, in a glass with a chilled base. Interestingly, the 15’s honey and sherry notes developed a spicier profile, while the finish was warm and likewise spiced. 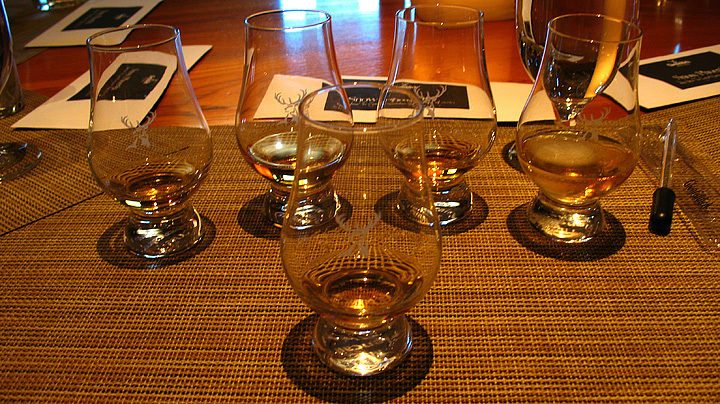 The Snow Phoenix (front) and L to R: Glenfiddich 12 Year Old, chilled 12-Year, the 15-Year and the 15 with ice. Tasting glasses of the Snow Phoenix were then placed before us; it was time to meet the star of the show. As we nosed the gold-colored expression, notes of vanilla, apple and pear greeted us. On the rich and creamy palate, we tasted roasted apples, honey and chocolate, and hints of coffee and smoke. The wonderfully long finish rewarded us with sweet notes of sherry and spice. The distillery’s Robbie Dhu spring water has tempered the heat of the Snow Phoenix, which is surprisingly mellow for a 95.2 proof whisky. One thousand bottles of the Snow Phoenix were initially made available exclusively to members of the Glenfiddich Explorers online club. A total of only 12,000 bottles will be in circulation. Bechard said he was surprised when he was told the Snow Phoenix would retail for $89.99. Given the Snow Phoenix’s uniqueness and limited bottling, Bechard said it could have been priced at least twice its list. Bechard said the Snow Phoenix’s pricing makes it possible to buy one bottle to enjoy now, and another to keep. Entrepreneurial types are taking advantage of the Snow Phoenix’s scarcity and affordability; bottles have already started showing up on eBay UK. 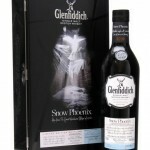 Whether you buy one bottle or several, the Glenfiddich Snow Phoenix is a singular release well worth seeking out. Born from adversity and inspired by myth, the Snow Phoenix will land in stores only briefly before it passes into lore on its likely path to cult status. For more information, visit www.glenfiddich.com.